Painted Bone Reading Set by Tsura Nuri of Tarot by Seven. I’m back! It is summer vacation for me with no classes till August. I have several items to review before school starts again and this is the first. 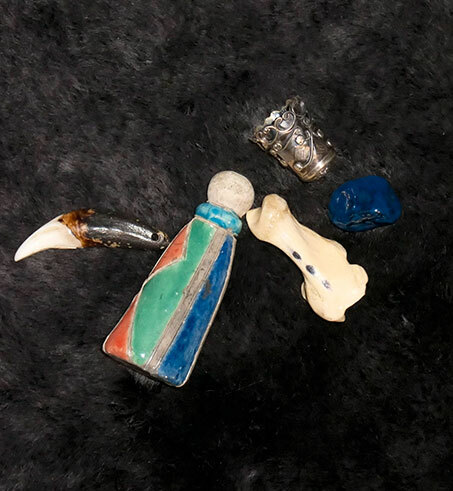 Tsura Nuri of Tarot by Seven posted a painted bone reading set in the Facebook Bone Reading Group and offered it for sale. I tried to purchase it, but someone beat me to it. Fortunately she offered to make another set for me. She offered me several options as to design such as shiny or matte, and highly decorated or more primitive. I asked for a set with samples of each. I must say that I am very pleased with the set I received. Larger bones painted with clues to interpretation in wonderful detail, as well as some painted with just decorative symbols. The number of pieces in each set varies depending on availability, and per Tsura “depending on the chicken.” Most sets are made from chicken bones, which have been painted with acrylic paint, Prismacolor pens and then coated with several coats of polyurethane in most cases, though some of the bones in my set appear to have been left matte as I requested. Some sets are made with Cornish Game Hens as well. There is a sheet with a photo of the set with suggested meanings for the various pieces. Of course you are free to adapt or change the interpretations as you see fit. The pieces that are highly decorated such as the piece with a house, and the piece with clasped hands, easily lend themselves to interpretation. My set also has some pieces that are just decorated with symbols such as stripes, and dots where the meanings are deliberately unassigned to allow you to assign any meaning you wish to them. 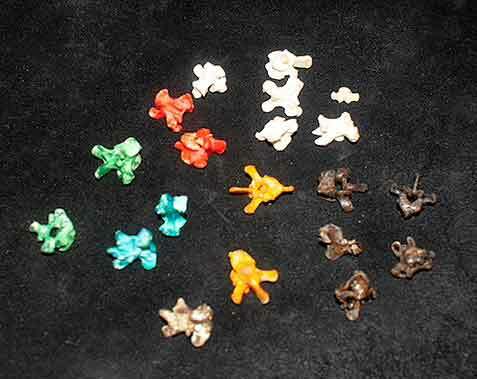 There are a significant number (20) of vertebrae painted in different colors. A suggested use/meaning was provided for them as well, but were I to actually read with this set, I most likely would assign them to people and maybe decorate them further to distinguish male from female. 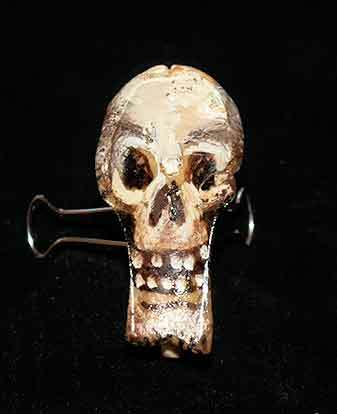 This skull is one of my favorite pieces. It is held up with a paper clamp so that the front can be seen. 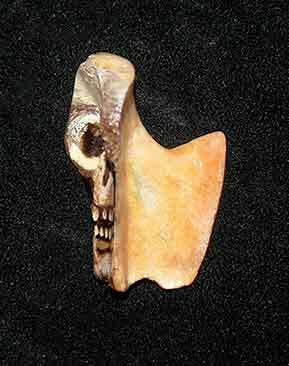 Side view of the skull. 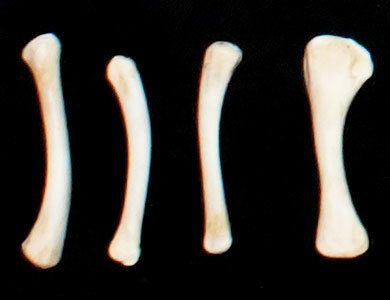 Front and back view of two bones. I have seen other sets that Tsura has painted that have symbols specifically requested by the person who ordered the set. As an artist I love the idea of painting scenes and symbols on bones. The end result is attractive, and it makes the meanings easier to learn. Tsura is a skilled artist and the pieces have wonderful detail, especially considering the small scale and the curved surface she was working with. 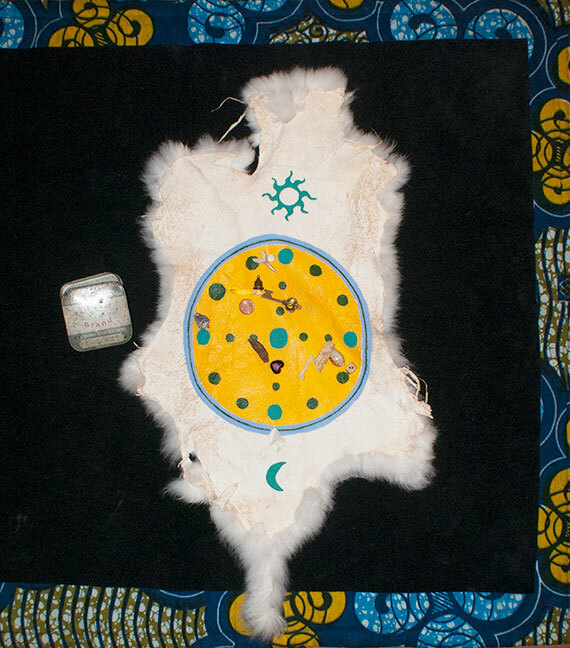 I have pieces in my reading set that have been decorated with markers and paint to distinguish which side of the bone is showing, or to assign other distinguishing characteristics to pieces that would be otherwise difficult to distinguish one from the other, such as cowrie shells. But this is the first set I have seen that has almost every piece decorated with paint. I think we will be seeing more people painting pieces of their sets in a similar fashion in the future. 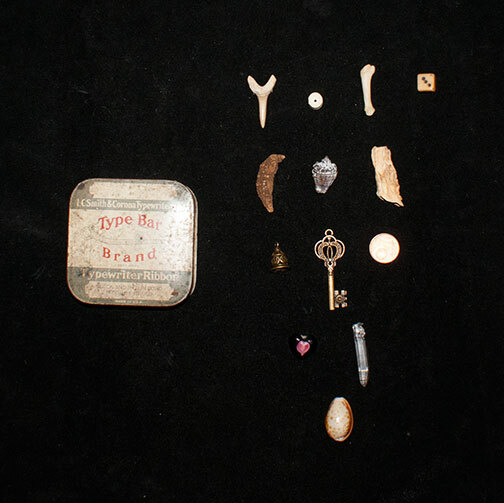 I found the Promise Land Tannery Animal Bones Divination Set while looking for real animal bone lots on Etsy to put into a little swag bag for my presentation at the Mile High Conjure Gala. 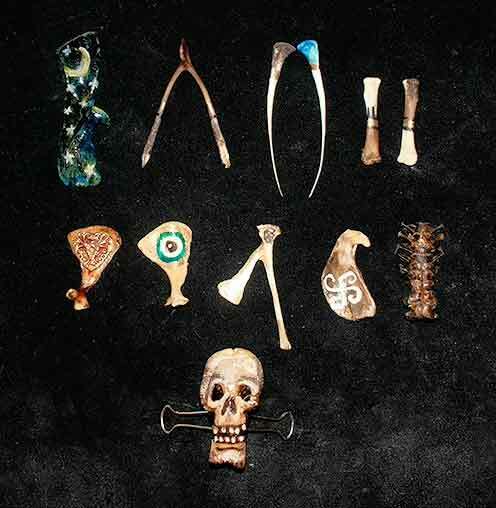 It is a very nice set with a good selection of animal bones, teeth, and claws which can be used as is if you like, or which can be used as the foundation for a larger set. I am calling it the Promise Land Tannery Animal Bones Divination Set because that is what the card on the set says, but the name of the Etsy shop is Furries Leather and Fur Shop, and they have a wide selection of bones, teeth, claws, horns, furs, and other cleaned and processed animal parts for sale. You can order the set as shown or you can make a custom request. If they are sold out, you might want to try asking them to put a set together for you. It is an all day event with the schedule arranged to maximize the amount of classes you can take, and you can also purchase a ticket for the Dinner of the Dead with the presenters. I have several roots and other organic pieces in my bone sets. One of them is Little John to Chew or Galangal (Alpinia galanga). I use it primarily to represent court cases and legal matters. However, if the client is not involved in any legal issues at the time I sometimes interpret it as a warning to be honest, and above-board in all of their dealings, and to do things by the book. Avoid short-cuts or cutting corners. Cross every “t,” and dot every “i.” Failure to do so could lead to future legal issues. Pieces nearby can shed more light on this piece. If it is near the heart, perhaps a divorce or family matter may end up in the courts. 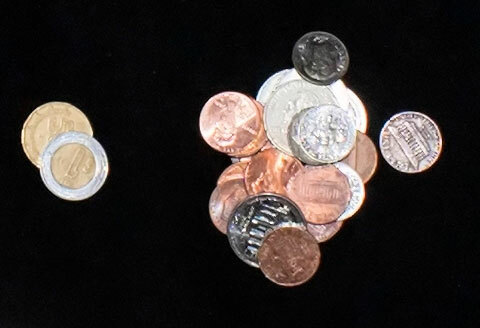 If it is near a large sum of money it can indicate receiving (or paying) a settlement. I often see this piece when the client is considering starting a business of some type. It can be a warning to get all agreements or contracts in writing, and/or to enlist the services of a lawyer before signing anything. It is a sturdy root and mine have held up well for several years now. 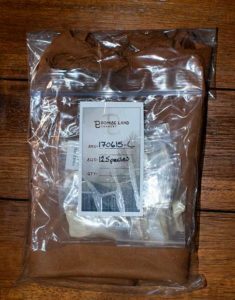 You can get it from shops that sell hoodoo herbs, or from shops that sell Asian spices as it is used in cooking some Asian dishes. It is a member of the ginger family (sometimes called “Thai Ginger”). Don’t buy the fresh version – get the dried with whole pieces, not slices. You can read more about this root in Dr. E’s article about the three Johns. Little John to Chew with the piece for the heart and the client’s partner. I got this set from The Ritual Witch Shop over a year ago, and sadly they are no longer available. The shop owner says that she will have sets with different pieces after the New Year, so if you are interested check back after the holidays. 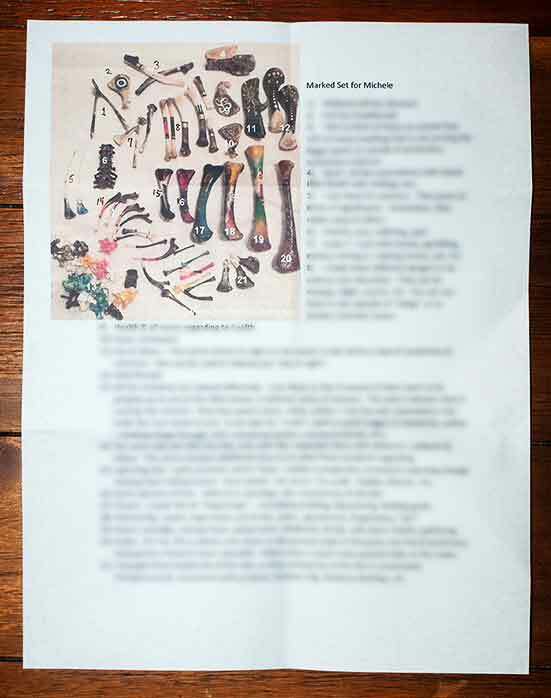 A one page sheet with brief suggested meanings came with the set. As previously stated this set is no longer available but The Ritual Witch Shop plans to offer bone sets again after the New year. I have a canine tooth in both my sets. They are naturally colored on the tooth end and darkened on the root end. 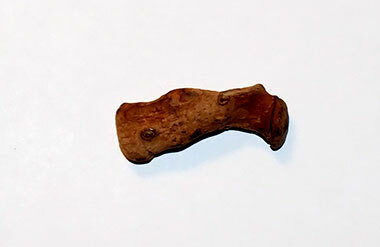 I originally had a dog bone in my sets, but when I got the teeth I replaced the dog bones because I felt using a tooth gave me a wider choice of meanings. I interpreted the dog bone as the good qualities of dogs – faithful, loyal, protective, companions. The bi-colored tooth gave me the option of adding a more negative interpretation. So the tooth could be the faithful, protective, loyal companion, or it could be the snarling, growling, biting, attacking dog. The dark end seems to come up in readings more often than the lighter end. I find that when the dark side is prominent in relationship questions it can indicate arguments, disagreements, or tension in the relationship. Almost all relationships will experience these things, but when this side of the tooth is in a prominent position, the fighting could be becoming more frequent or more of a problem. It can also represent anger on the part of the client and a need or desire to fight for oneself. Conversely, if the light side is prominent, the person is probably loyal, faithful, and protective. 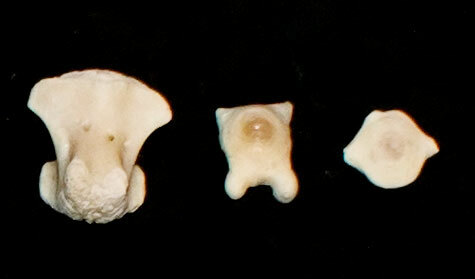 I got the teeth I use at a gem show, but you can find teeth from canines on Ebay or Etsy. P.S. I will be a guest on Candelo’s Corner Monday the 24th of October. I would love to see you in the chat-room. *These are sample interpretations for illustrative use only. You may see a different interpretation based on your own experience or understanding. 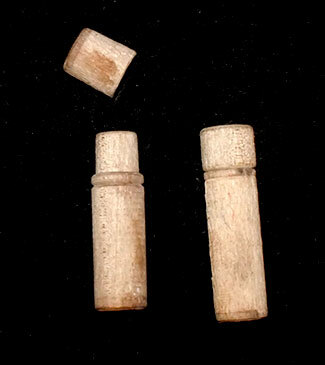 Mother Maggie’s Travel Bone Sets are small sets similar to the Pocket Bone Sets by The Mystic Cartel, which makes sense since the pieces themselves and the instructions are sourced from The Mystic Cartel. What makes these sets unique is their packaging and the fact that each set has different contents. 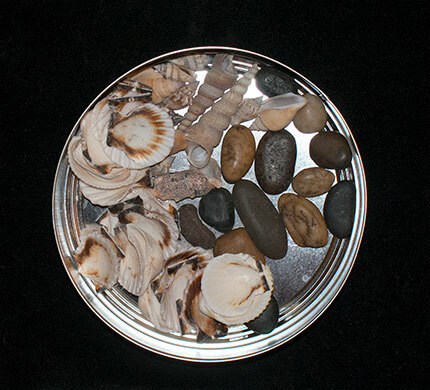 Some sets have the familiar round tin of Pocket Bone Set, but you can also get them in antique tins, or even a Sucrets tin. The number and type of pieces vary depending on the container, and the prices vary accordingly. The sets come with four pages of instructions to get you started, and the set can be used as is, or as a starter set to build upon. There is room in the tin for more pieces should you decide to add pieces. 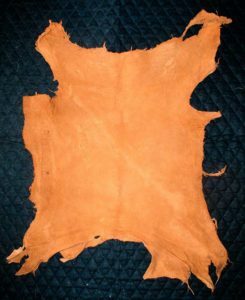 Rabbit skin does not come with the set. You can order a set here. I got this set from Etsy early this year. The vendor does not have any items for sale at this time so I am not including the link as I am not sure they are in business any longer. 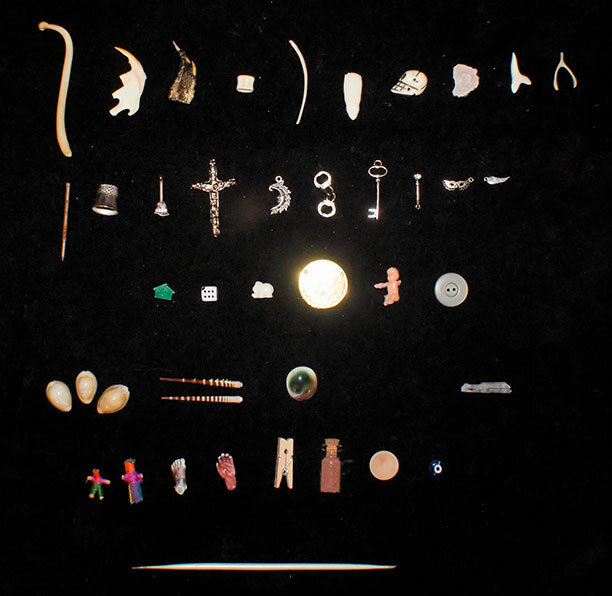 I am an unrepentant collector of bone divination sets and the fact that I do not read the bones using a one species method did not dampen my collecting instincts. 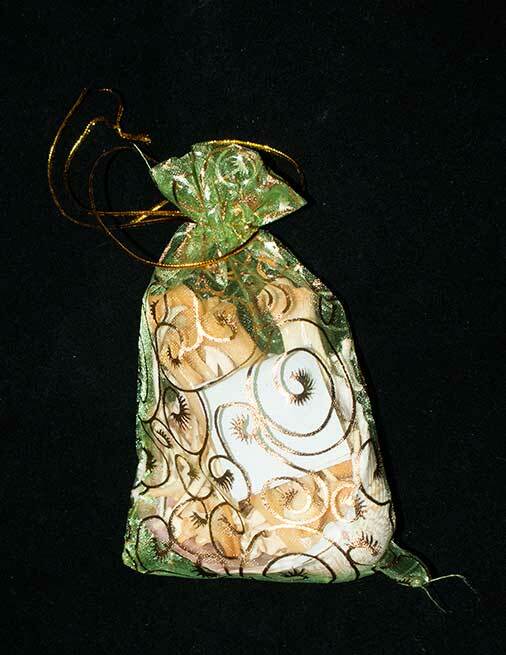 This set also comes with a shell that could be used for storage and/or casting, and a drawstring bag. The largest bone is almost 4 inches long. The larger bones have a clear sealant applied which gives them a glossy shine. If I were going to use this set I would remove the gloss with a very fine sand paper as I don’t care for it, but some may find it both appealing and/or useful. There were no instructions in the set – the seller suggests purchasing a book on the topic if one is so inclined. 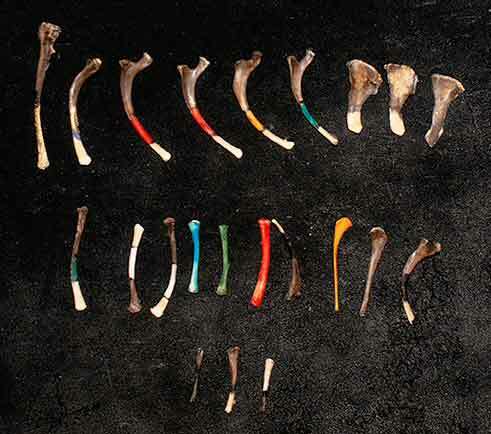 One species sets usually use bones from a chicken or opossum, making this set somewhat unusual. 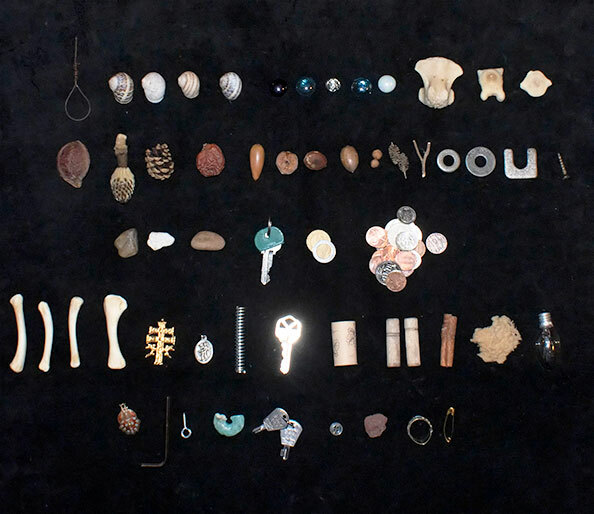 If you are interested in one species style bone divination you can get an overview and some suggestions on how it is done in Throwing the Bones: How to Foretell the Future with Bones, Shells, and Nuts by Catherine Yronwode. 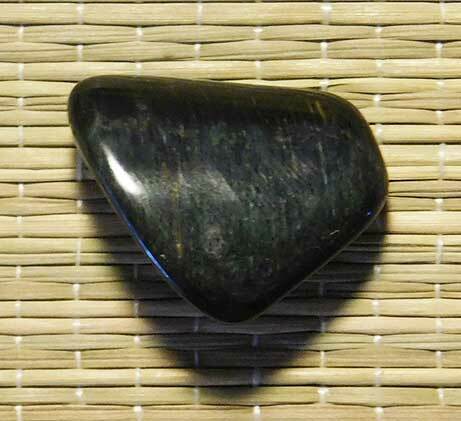 Stone to represent fear or worry. Do you have a piece in your set that represents fear? I do. 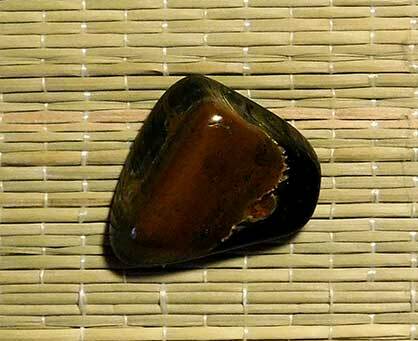 In my travel set it is a small tumbled stone that is solid black on one side, and brown and black on the the other. If the solid side is up I assume it has nothing to say in the reading, but if the brown side is up, I look to see what is nearby because it indicates that the client is dealing with some type of fear. These pieces could be interpreted as fear about a romantic partner’s feelings. We have all been afraid many times. Sometimes our fear is justified – if our physical well being is threatened we naturally feel afraid. But I find that most of the time when I am feeling fear it is not because I am being threatened with bodily harm. Most of the time fear is about the thoughts we have or the stories we tell ourselves rather than real physical danger. We fear being left alone, we fear losing our job or our source of financial security, we fear for our health, we fear for our children and loved ones, and friends – the list goes on, and on. Since we all have fears I find that a piece to identify them is quite useful. If you find the word fear too strong, you could substitute worry. This could be interpreted as fears or worries about work/career possibly involving another person. I often find that when I tell a client about the fears or worries I see in the throw they are relieved that I brought it up so that they can talk about them. I always listen carefully and look at the rest of the throw to see if there is any other information about the area of concern that could be useful. Identifying a fear can also lead to a separate throw about the issue with an eye towards what can be done to mitigate the issue and/or achieve a favorable outcome. Sometimes the fear piece is brown side up, but there are no amplifying pieces nearby. This could indicate anxiety or just a feeling of general unease or worry. Hopefully the reading will give the client concrete areas to focus their energy and thus provide some measure of relief. While I chose a stone to represent fear you could use anything that represents fear or worry to you, say a spider, or a small weapon like a miniature knife or a pointed stick or twig. These items have the additional quality of being able to point directly at other pieces. I have found the fear piece to be very useful. Perhaps you will too. Back side of the stone representing fear or worry. I found this set on Etsy in a shop called Blue Moon Hoodoo. At the time I found it they were selling both a 27 piece set and a 35 piece set. I bought the 35 piece set. When I last checked there were no more sets, so I don’t know if they are temporarily or permanently out of stock. Each piece was in its own plastic baggie. The set has a nice mix of pieces. 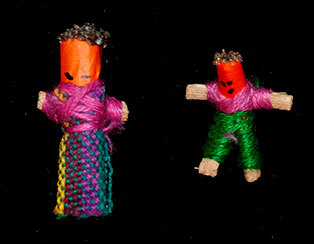 I liked the male and female worry dolls provided to represent the person you are reading for. 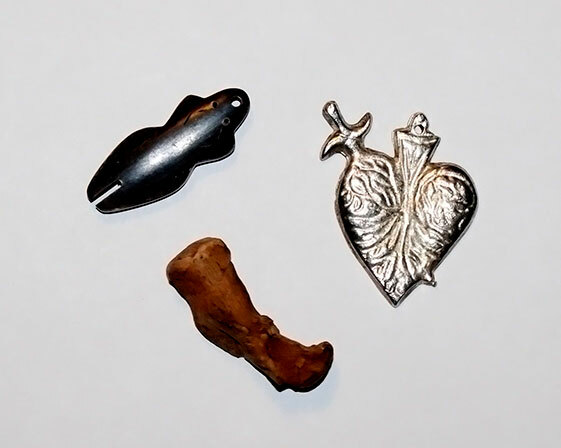 The set comes with suggested meanings for each piece. 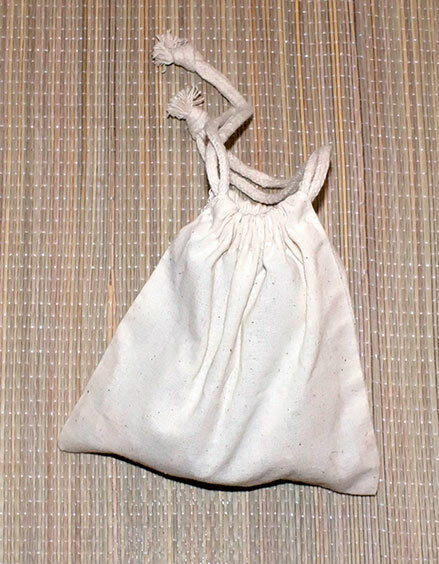 The set also has a bag for storage and a porcupine quill that can be used as a pointer. The set is small enough to fit in your hands for throwing. Koko the cat photo bomb. 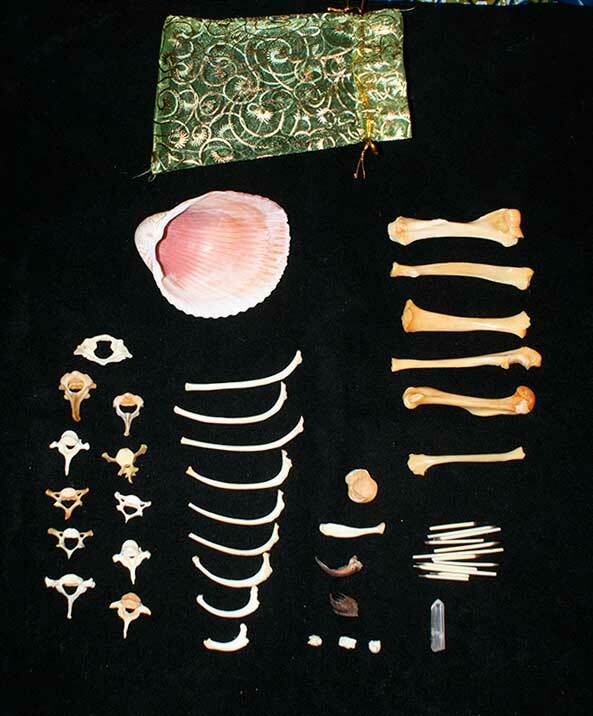 Blue Moon Hoodoo Etsy Shop 35 Piece Bone Set.